Online Reputation Management (ORM) is crucial in today's world of 24 hour news cycles, blogging, social media and viral videos. In just a few days or weeks, negative publicity can destroy the online reputations of individuals, corporations and even non-porift organizations. Even if this publicity is completely false, the damage can be significant. In just a few days or weeks, negative publicity can destroy the online reputations of individuals, corporations and even non-porift organizations. Even if this publicity is completely false, the damage can be significant. 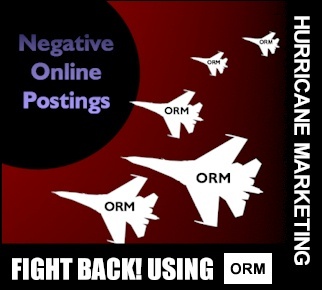 Hurricane Marketing's Online Reputation Management programs drive negative press down in the search engines and creates positive web references and publicity to combat negative Internet stories, postings and bloggers. In addition, they create positive web references and publicity to combat negative Internet stories, postings and bloggers. Our ten plus years as search engine experts gives us the tools and experience to show you or your organization in a positive light so that the World Wide Web works for you and not against you. The next move is yours. Let Hurricane Marketing repair your online reputation this week. Our programs can be launched within 24 hours if necessary and begin to work immediately. All online reputation management is done on a confidential basis. All information on our services to you will remain private. We are happy to sign nondisclosure agreements.